This unique grilled summer salad is the result of a category three brainstorm and a little flavor research. I've long wanted to try grilling watermelon, and I finally decided to actually go for it last weekend. Once I made that decision the next question was what I'd do with it. I needed some sort of dish, and I came up with this with the help of one of my favorite go-to resources, The Flavor Bible. This reference is indispensable for situations like this where you have a flavor and need to find other flavors and ingredients to accompany it. 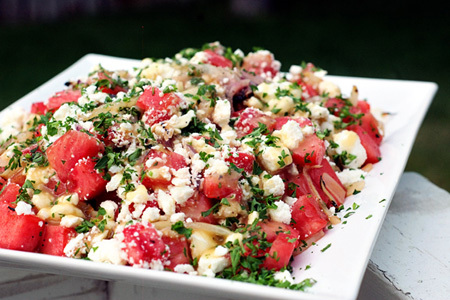 In my research I found that fennel pairs well with watermelon, and red onion, lemon and feta work well with fennel. Since the watermelon would be grilled I thought I'd grill all of the main ingredients, and that's exactly what you see here. This didn't last long, and the ladies of the house told me to put it on the "Make That Again!" list. Quarter the watermelon slice, arrange the wedges in a single layer in a gallon zip-top bag, and freeze for about two hours. Cut out as much of the core of each fennel quarter as you can while leaving enough to hold the layers together. Quarter the onion, leaving enough of the ends to keep the layers intact. Sprinkle the cut end of each lemon half with half of the sugar. Spray all sides of the onion and fennel lightly with the canola oil. 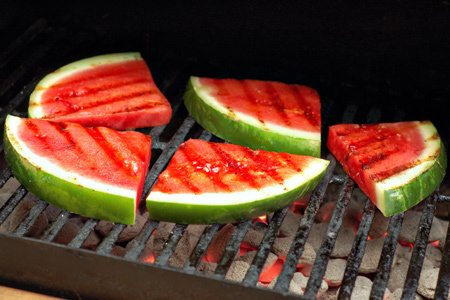 Grill both sides of the watermelon just long enough to get light grill marks, then remove to a platter and refrigerate. 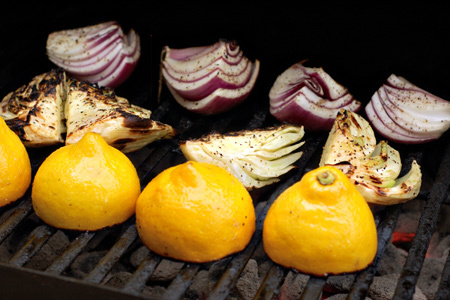 Grill all sides of the fennel, onion and just the cut end of the lemon until they are brown and begin to soften, then remove to a platter and refrigerate all but the lemon. Juice the lemon into a medium mixing bowl, then add the olive oil, vinegar, honey, salt and pepper. Whisk well to combine, then set aside. 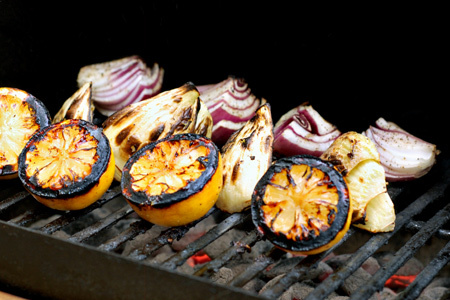 Trim any charred portions from the fennel and onion, then slice each thin (about 1/8") and add to a large mixing bowl. Add about two tablespoons of the dressing to the bowl and toss gently to coat the fennel and onion mixture. Cut the watermelon from the rind and into cubes (about 1") and add to the bowl and toss gently. Pile the salad on a platter, drizzle with the dressing (you'll likely have some left), and top with the feta and parsley. Note: I made a larger batch, thus the additional ingredients in the pictures. That looks really tasty, and we happen to have a watermelon in the fridge. Might have to try this! By all means, please encourage cat 3 brain storms! The Flavor Bible rocks and I bought my copy for my Kindle because you recommended it to me several months ago. This salad seems phenomenal, dude. It reminds me of a blood orange/feta/red onion salad we had last year and LOVED it. Thanks, Chris. The salad is admittedly wacky, but the flavors and textures worked well together. All hail The Flavor Bible! And for the cat-4 brainstorm I've thought of doing a grilled watermelon, fennel and lemoncello aperitif. Or, maybe a sorbet. My funky cousin is going to make this but with goat instead of feta. What are your thoughts on this approach? Anonymous - Feta is goat cheese, so it'll be great. to be technical there is goat cheese and there is feta cheese. feta cheese is a type of goat cheese but not all goat cheese is feta cheese.